Why hasn't anyone built a time machine yet so we can fix these mistakes? 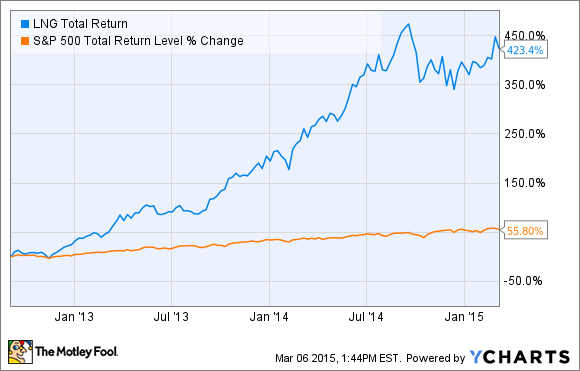 Investing isn't a perfect science. If it was we would all be filthy rich and have yacht demolition derbies on the weekend just to pass the time. Plenty of investments don't pan out, while other times we write off companies that turn out to be huge winners. We asked three of our energy contributors to each discuss a company they brushed off, only to watch the stock skyrocket while they sat on the sidelines. Here's what they had to say. 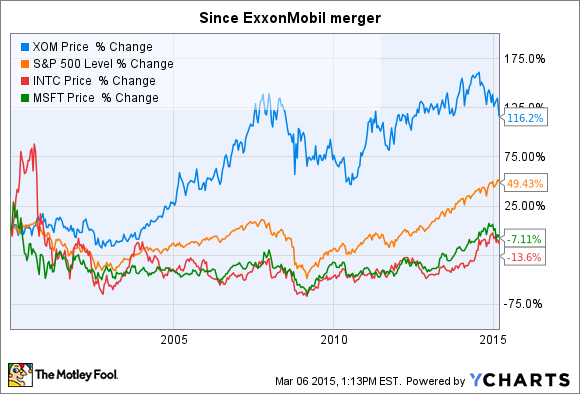 Buying ExxonMobil stock near the merger would have cost me about $39 per share. 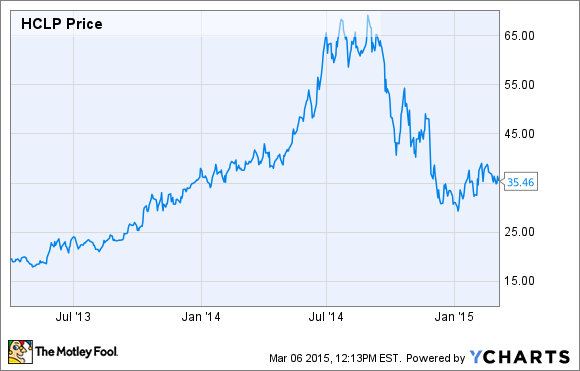 Over the past year, the company has paid out $2.76 per share in dividends. That's good for a 7% yield on the original investment. Furthermore, the company has paid out almost $15 per share in dividends since 2008 alone. 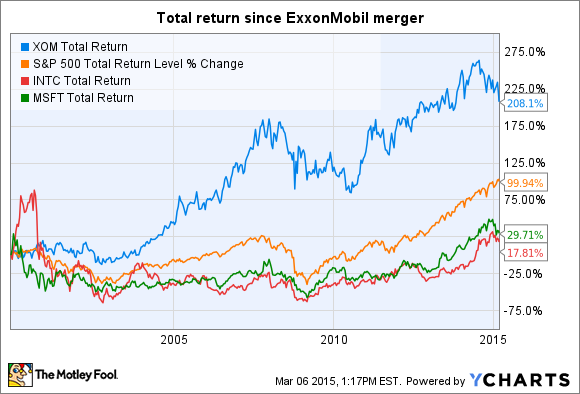 Someone who bought 15 years ago with an eye on getting paid years down the road did incredibly well investing in ExxonMobil. I missed out. Tyler Crowe: The first time I looked at Cheniere Energy (NYSEMKT:LNG) as a potential investment in 2012, I almost laughed. Here was a company that was an upstream oil and gas producer, then an importer of liquefied natural gas with a massive regasification facility, looking to build the nation's first liquefied natural gas export terminal years before anyone had realized the complete potential of the natural gas boom in the U.S. By the time I had taken a hard look at the business, it 1) had completely changed business strategy for a second time, 2) had loaded up on a ton of debt, 3) had not reported positive net income once in 20 years of existence, and 4) was using financial wizardry such as the IPO of Cheniere Energy Partners Holdings (NYSEMKT:CQH)-- which exists solely to own shares of Cheniere Energy Partners (NYSEMKT:CQP)-- to raise capital. LNG Total Return Price data by YCharts. What turned a hope and a dream of CEO Charif Souki into a viable business was the simple fact that the company was able to line up customers left and right to sell LNG under 20-year take or pay contracts. Those contracts guarantee a stable revenue stream for years to come at both its Sabine Pass and Corpus Christi facilities, which have close to 70% of their processing volumes under firm contract. This amount of certainty made it much easier to go to financiers to raise capital, and it makes the company look much more interesting as an investment. I'm guessing that if Souki reads this (he won't) he'll be the one laughing at me while sitting on a massive pile of money. This was clearly a case in which buying the stock instead of being cute and writing puts would have been the better idea. Even after coming off their high, Hi-Crush's units are still double where they were when I first wrote the puts. Even if I bought and held all the way through the ups and downs I'd be happy today, as that investment would have paid off a lot better than some of my other oil bets. In hindsight what I missed was the fact that frack sand was about to become even more important to drillers than I'd expected. Producers found that pumping two times, or more, sand volume into a well was the key to unlocking more oil from the tight rocks. Furthermore, despite the current drilling slowdown, producers are finding they can go back and refrack older wells with additional sand volume to boost production. Hi-Crush Partners and other frack sand producers still have a lot of growth ahead, even if things do slow a bit over the next few years. However, with its valuation having doubled from where I first wanted to buy, I'm going to have to pass on this company and just chalk it up as the one that got away.